Feeling a Change In Your Jaw This Fall? Fall is a season for change. The seasonal changes are good and beautiful, aren’t they? However, not all changes are good. If you’re experiencing some new abnormal pain and sensations in your mouth or jaw region, you may be wondering if you have something called TMJ Disorder. These TMJ (Temporomandibular Joint) disorders are actually pretty common. Your TMJ is a hinge and gliding joint located in the front of your ear. It enables your lower jaw to maneuver and function. It is also the most often used joint in your body, so it’s not surprising that is can be susceptible to disease and injury. There are many causes of TMJ disorders. Injury and disease are common causes. Stress can cause harmful habits such as grinding or clenching that can lead to TMJ. Misalignment in your mouth can be a cause as well. This fall, you may want to take an inventory of how you’re feeling. 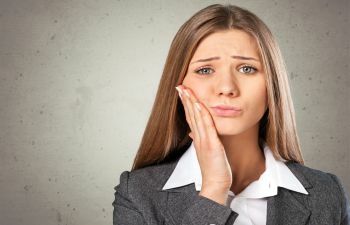 If you’re wondering if you might have a TMJ disorder there are some common signs and symptoms of the dysfunction that you can look out for. If you think you could have TMJ, it’s important to book your appointment with Napa Valley Dental Group. Our dentists offer TMJ treatment for our patients. We will take the time to determine the cause of your TMJ Disorder and make a plan to treat it. Call and book your appointment with Napa Valley Dental Group today.